I have been two and a half weeks in New Zealand and my time is drawing to a close. The weather has been simply wild and has reinforced to me yet again, we humans are but intruders on Nature’s landscape. With a flick of her tail, we are crippled by floods, high winds and high tides. The weather has certainly prevented me from a trip to the Mount Cook region, but at least it gave me some unplanned time to go through my slide collection which I have recently converted to digital copy. 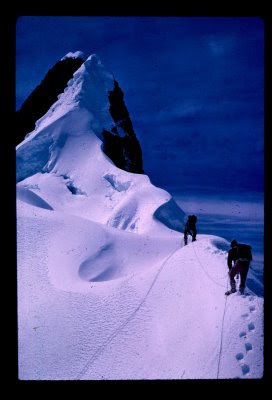 I have posted a few historic photos of my younger days in the New Zealand outdoors, and a few from overseas expeditions. As I post this and the wind swirls outside, I think of the words of Bob Dylan's song, "Come in she said, I will give you shelter from the storm." 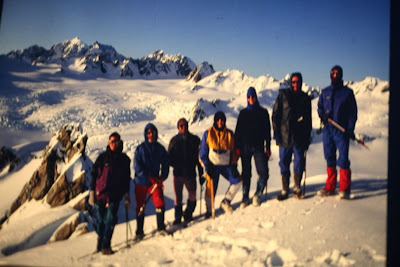 My favourite photo above was taken in 1991, when two teachers (Bruce White and Bruce Barnes)and myself from Westland High took a group of High School students up three 8,000 foot peaks at the head of the Franz Josef Glacier. This photo was taken on the summit of Mt. Mildred with the Franz Josef neve, Mt.De la Beche and Minarets, together with other peaks of the Southern Alps, in the background. 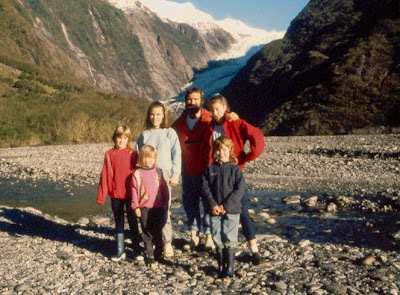 In 1990 Chris Bonnington was invited to New Zealand as a 'Living Treasure'and a group of us took him climbing at the head of the Fox Glacier. 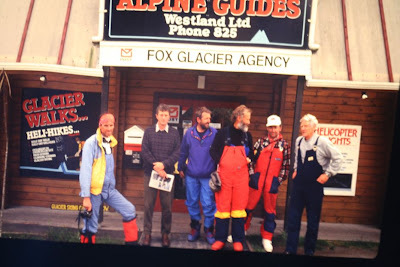 (L to R)Colin Monteath, Mike Browne, Dave Bamford, Chris Bonnington, John Nankervis and Ed Cotter. 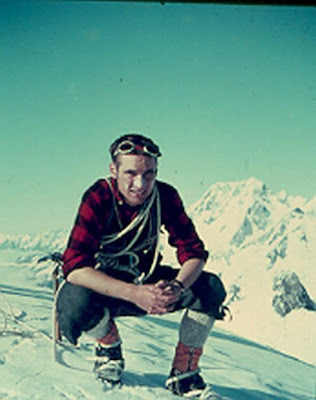 Bob McKerrow on the summit of Malte Brun, Dec 1967. (L to R) Keith McIvor, Bob McKerrow, Jan Sarnquist and Jim Cowie after a successful first ascent of a variation on the Notch Route, Mt. Talbot. 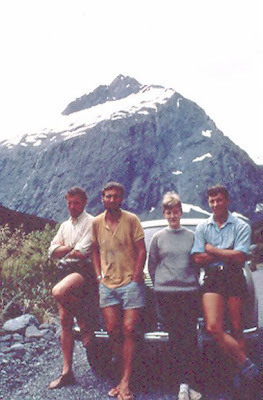 Photo taken near Homer Hut near the Homer tunnel 1969. 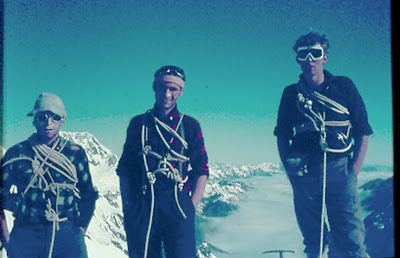 Jim Cowie, myself, Rod McLeod on the summit of Mt. Malte Brun. Mount Cook Aoraki is behind Jim’s left shoulder. Dec. 1967. 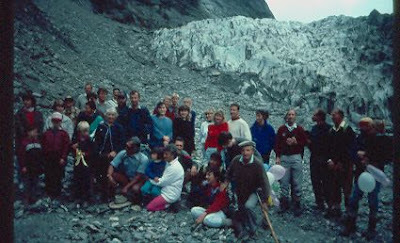 The last guided glacier trip by Rangi Tinarau, the famous Franz Josef guide. Ther THC lost the concession in 1991 as they sold the Hotel. Rangi is in the blue shirt crouching to the left of centre in the front. The highest road in the world. The Khardung La in Leh, India. 2001. 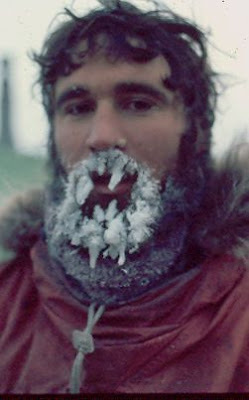 During the winter of 1970, when I wintered over at Vanda Station, Antarctica. 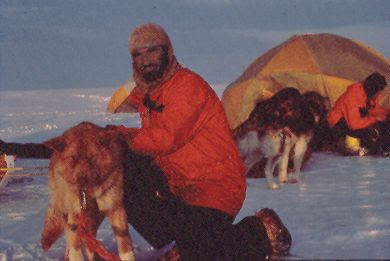 With one of the lead dogs on the 1986 Steger International North Pole expedition. Taken on the Arctic Ocean. 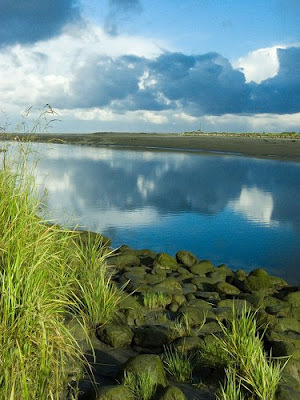 Ten km south-west of Timaru, is a cameo of rural New Zealand. Otipua township boasts a population of around 100 with a community hall, a primary school, a church and a war memorial. Not much different to tens of thousands of small rural townships in New Zealand. It is a township without a general store or gas station. 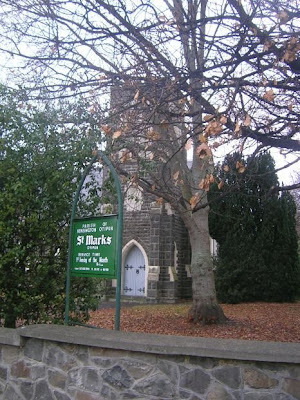 On a hill, in High Street, is St Marks Anglican church, built from local stone in 1893. Today there is only one service a month, at 9 am on the first Sunday every month. My daughter Anita, her partner Jonts and their 3 boys, Harper, Jed and Billy have bought a small farmlet here and are remodelling an old farmhouse, and an outbuilding which was the original village bakery, built crica 1890. The people who live here are a mixed bag : farmers, city workers who live here for the quality lifestyle and retirees. It is a positive community with little or no traces of criminality and where the community hold summer and winter community pot luck dinners so people get an opportunity to know each other better. Anita and Jont’s farmlet is on the corner of Beaconsfield Flat Road and Beaconsfield Road, and at the apex of the land in prominent view, is a memorial for those soldiers from Otipua who lost their lives for New Zealand in the Great War 1914-18. The names of those from Otipua who died during the First World War. May their names live on. Eleven young men from this district died in Europe fighting for their Motherland, Great Britain. One was a Major who won a DSO and a Captain, who won the Military Cross. Obviously brave men who bore names from Scotland, Wales, England and Ireland. It’s 11.30 am Monday morning. New Zealand was in mourning yesterday after Australia toppled us in the rugby test on Saturday night. This morning I helped Jonts, Harper (4) and Jed (2) rake and pick up long grass and dead weeds on a small paddock. Moby, their large Labrador, chased sheep.The section was so overgrown when they moved in some months ago that it has taken a marathon effort to tidy it up and restore the pasture. 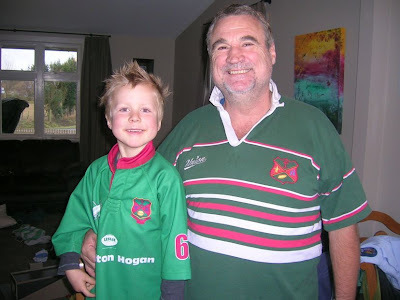 With Harper, my Grandson, Harper plays rugby for the Marist club and I wear his Dad's Marist jersey. About 10 am I cycled towards the Hunter Hills freshly covered in snow and beyond, the mighty Southern Alps, with snow clouds covering the highest peaks. In the foreground paddocks dotted with sheep, neatly fenced with tall trees, providing wind breaks from the snow laden winds. The last week of extreme weather conditions in New Zealand from cyclonic storms and storm surges in the North Island to heavy snow falls in the south, signals it should be a time for hibernation, not the exploration I planned for. I travelled over Arthur’s and Lewis passes last week, but the bad weather prevented me from going to Mt. Cook Region and doing small trip. With cold and sunless days I consider going into semi hibernation and reflect rather than do. Having lived with Inuit hunters and north American Indian fur trappers inside the Arctic circle, I noted how, they go into a form of semi hibernation as darkness descends for 24 hours a day. Their biological clocks skow down and they engage in little activity apart from feeding dogs. brewing tea and cooking meals. In 1970 I wintered over at New Zealand’s long closed Vanda Station in Antarctica. At that time we were the smallest ever group to winter over in Antartica. In the dark winter months I can recall that feeling of cabin fever overcoming us as we had to fight off the temptation to withdraw and hibernate. We ignored our biological clocks and never lowered the so called standards, whose standards ? Those of Harold Lowe a dour Scot who led our team or more aptly described, was our leader. I never knew why we needed a leader as he contributed little. It was a New Zealander who proposed the first 40 hour week, a Spaniard who invented the Siesta, and I would like to be the person who offers all New Zealanders a 3 week winter hibernation holiday which would reduce our ever increasing electricity consumption, reduce road deaths, reduce heart attacks from being over stressed, and hopefully increase our baby boom so we will have someone to pay for our pensions when we get older. Yes, sleepy Otipua has made me examine the quality of my life and I look forward to spending more time semi-hibernating, reflecting rathet than doing for a few days while the bad waether passes. Update: More weather warnings on Monday night and further snow in the South Island. On Tuesday 29 July, another cold wet morning. 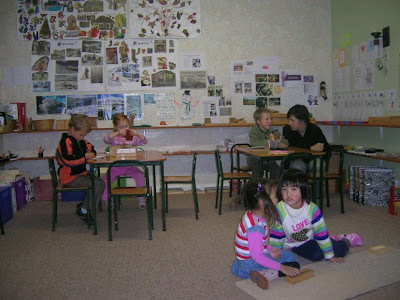 Took Anita my daughter, and Harper my Grandson to Montesorri Kindergarten in Timaru. So wonderful to see young children playing so calmly, so creatively. This is a real learning nest. Montesorri education is based on the inner motivation of the child, and for the teacher's role to work with this motivation in ways that will enhance the child's process of self creation. I enjoyed my time watching children play and enjoy learning. I am about to get the Intercity bus, the successor to the New Zealand Railways bus service, from Timaru to Christchurch. I am posting this dispatch from the Internet Cafe at the bus station. I enjoy travelling by bus where ever I am. 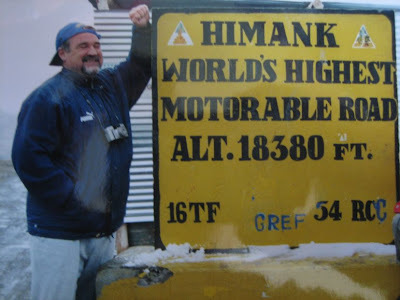 In February and March this year I spent 3 weeks in the the Indian Himalaya and used buses to get about. Travelling by bus in NZ has many similarities as you get closer to the pulse of people, places and it offers you a chance to talk to fellow wayfarers. Tomorrow I am looking forward to meeting a fellow blogger, Marja. Blogging shrinks the world. With the weather forecast predicting continuing rain and snow, I will be in Christchurch hibernating the next 5 days, before returning to Indonesia. It was beginning to snow when I left Hamner Springs yesterday and today the Southern Alps are getting another blanket of snow. I am happy to be writing this from the warmth of my house in Christchurch, with a roaring log fire to keep me company. It was a joy to reconnect with the Southern Alps of New Zealand again after almost two years away. That spiny backbone that stretches down almost the full length of New Zealand, dividing West and East in a most distinctive manner, separating the wetter west coast from the drier east coast. 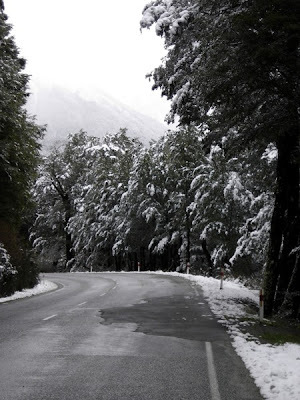 There are only three motorable roads across the Southern Alps, Arthurs Pass, Lewis Pass and far to the south, Haast Pass. Apart from mountains, I love visiting river mouths and see the power of river meeting sea. I managed to see the mouths of the Hokitika and Grey rivers and spent time gazing at the Waimakariri, Taramakau, Grey and Hokitika Rivers. View from near Mt. White Bridge. I left of Monday day with my nephew Paul, who is about to leave for Pakistan to work for the Red Cross. 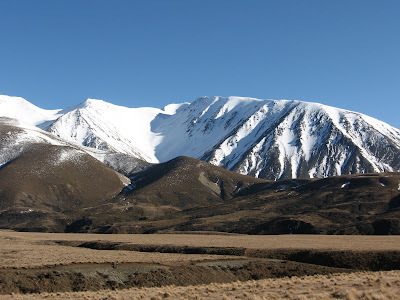 We drove across the Canterbury Plains, and climbed up to Porter’s Pass onto that upland Alpine plateau. The winter sun draws out the earthy colours of the tussock, barren brown slopes up to sparkling snow-line and sculptured basins leading to piercing summits and a deep blue sky. Such beauty inspires awe in me. At White’s Bridge we stopped to gaze at the braided Waimakariri and the peaks at the head of the valley. Passed Klondike corner where I have spent many nights coming off climbs and during the Coast to Coast endurance event. Winding up to Arthurs Pass township The clusters of beech forest are impressive as the peaks on either side of the road hemn you in. We drove to the Rolleston Otira Face lookout and watched the cloud roll down from the summit down that fluted face. 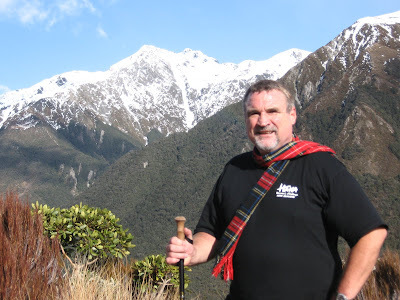 I recall climbing the Otira Face in 1969 with late Keith McIvor. Later we traversed on to Philistine an enjoyable traverse in those days. 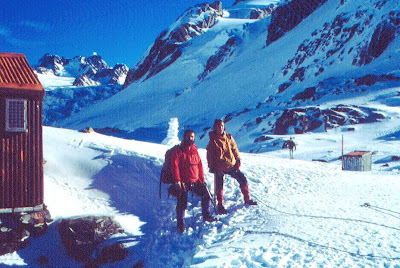 Then again in 1995 climbing Rome Ridge with Bruce Watson and Bruce White, and descending by the Otira slide. I did some skiing up here in the 90's and asked Myles Mackintosh if I sould use his photo: "Kilmarnock Spur" on route to Mt Davie (2280m) to show the great skiing at Arthur's Pass. 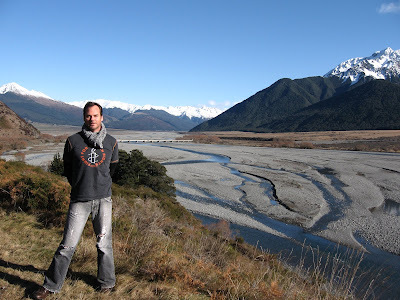 I visited the Hokitika River which I rate as one of the most interesting in terms of history and raw beauty. Later that day I also visited the mouth of the Grey River and watched the mighty river pour into the Tasman Sea. I thought of those countless ships that were wrecked crossing the bar. 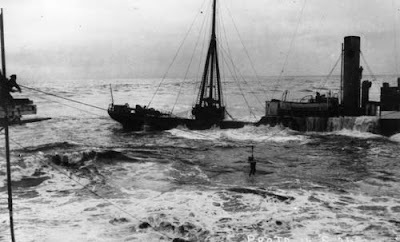 This shows the Hawea soon after she ran aground at the entrance to the Grey River at 1.30 p.m. on 30 October 1908. There was a heavy swell, and the crew was in imminent danger of being swept overboard. A line was cast on board by rocket and, as shown in this photo, the crew were brought ashore one at a time. The last man landed at 4.15 p.m., and soon after the Hawea broke up. While in Greymouth I popped into see Pat and Murray Reedy who run Silk Road Adventures from their home south of Greymouth. They are a warm and innovative couple and few, if any, independent operators know Central Asia as well they do. They have a decade of hands on experience behind them and can deliver quality journeys at the right price. I was one of their trip leaders when they first started out and led a journey through Uzbekistan, Kyrgyzstan and Kazakhstan, looking at the fabled cities and following the Silk Road. So I know first hand the emphasis they put on quality control and how hard they work to ensure that their products are amongst the best designed, planned and supported available. 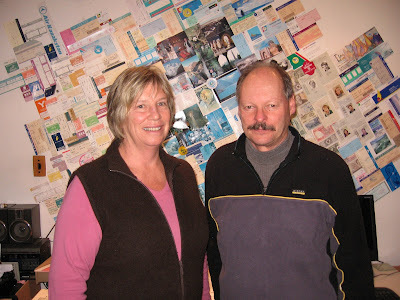 You get plenty of choice when you travel with Murray and Pat, and can work with them to design your own itinerary or join one of a select small group. I am working with them on a trip I plan to do to Kashgar next year from Pakistan, to China and then on to visit my wife's parents in Kazakhstan. 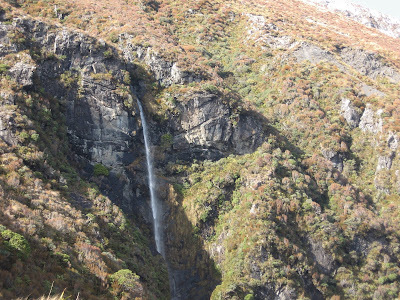 With Pat and Murray's trips, you can choose to undertake one of their "great overland journeys" and you can join them or mix and match to suit your own interests from the itineraries that they have selected. If you want to learn more about Murray and Pat have a look at their website. While I was in Hokitika I popped in to see Brian and Francis Ward who own Teichelmann's Bed and Breakfast using the old surgery of Dr. Ebenezer Teichelmann. Teichelmann’s Bed & Breakfast offers a glimpse into New Zealand West Coast heritage, featuring fascinating memorabilia from days of pioneering exploration into the Southern Alps. Dr Ebenezer Teichelmann was a renowned mountaineer, photographer and conservationist and had this historic house built as his first home and medical rooms in 1910. I lived on the West Coast for some years and I researched extensively Dr. Ebenezer Teichelmann and published a book in 2006 on him. Looking towards the Southern Alps from near Maruia Springs. 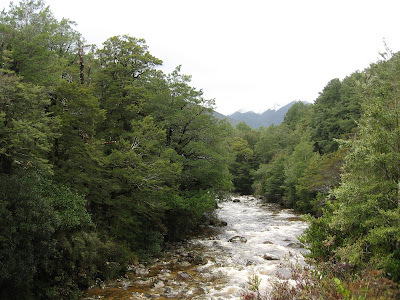 On Tuesday I drove from Greymouth up the Grey Valley, Springs Junction to Maruia Springs. Driving along the road through the Lewis Pass from Springs Junction to Hamner Springs is a scenic feast – rivers, mountains, mountain tarns and native New Zealand beech forests. We spent a night at Hamner Springs and then back to Christchurch yesterday. Thanks Paul for your superb driving and great company. 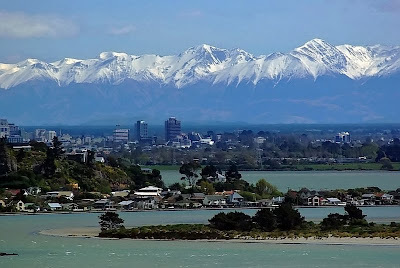 Later this afternoon I head off to Timaru where my eldest daughter and my three grand children live.I hope to head off to Mount Cook Aoraki early next week, weather permitting. As I write the snow continues to fall in the Southern Alps bringing much needed snow which will later fill up our hydro electric lakes. 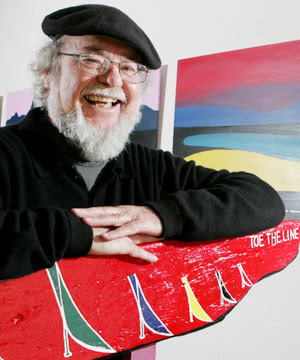 Quadruple heart bypass inspires Juddy to be an artist. 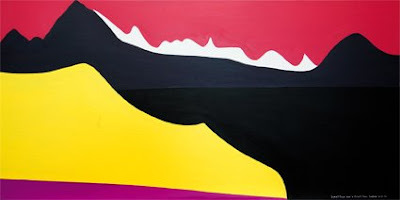 Iraq: Robin Judkin's first painting. "I have been collecting pieces of driftwood and timber from Kumara and Sumner beaches for 25 years and “Iraq” landed on Sumner Beach in the form you see it today - two pieces of equal length timber nailed to a wooden upright that might have been part of a gate but now looks like a sign." I have been back in New Zealand five days now and I am enjoying meeting friends and family. Some of my friends are a little "off the wall" and I know that I tend to pick friends who stimulate, provoke and inspire me. Someone remarked to me some months back that a number of my friends are iconoclasts. Maybe he was right.Juddy certainly fits that category as a radical who likes breaking false images or exposing imposters. 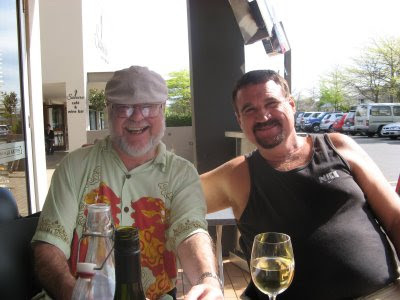 Robin Judkins (Juddy) picked me up last Friday at my home in Christchurch shortly before lunch. He came on the pretext of taking me out for lunch to meet Phil and Roget, two friends who are business men. “Why, ?“ I asked. “ Can you read this while I drive .” he asked with a gremlin-like smile. He handed me a beautifully designed brochure of his first painting exhibition to be opened next week at the Kinder Gallery in Sumner. This was going to be a sneak preview for a good friend. “ Juddy, you are a failed poet and now you are trying to be an artist,” I jibed after the first glimpse. 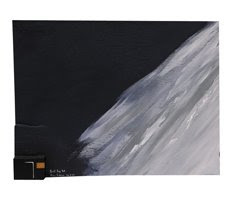 As I unfolded the 8 page brochure, I quickly realised that in the last year, Juddy had made some striking, colourful abstract paintings where Canterbury mountain landscapes dominate and strange art using driftwood. We chatted as he drove me to Sumner explaining that after his quintuple bypass operation on April 17, 2007 he started contemplating a fairly bleak future.He soon came to the stark conclusion that he would turn his disability into his opportunity and on July 14 2007, he picked up his daughter Bonnie’s paintbrushes and painted “Iraq, ” thirty-nine years after he had painted a portrait of a girl he had fancied at University. “I have been collecting pieces of driftwood and timber from Kumara and Sumner beaches for 25 years and “Iraq” landed on Sumner Beach in the form you see it today - two pieces of equal length timber nailed to a wooden upright that might have been part of a gate but now looks like a sign, “ he proudly recalled. 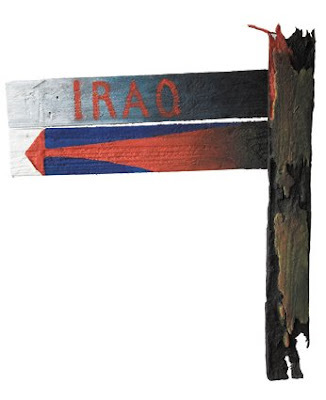 “Iraq” took two days to draw and paint and then I couldn’t put the brushes down. "Everything I looked at every piece of flotsam and jetsam took on a new meaning,” he said with intense passion. His exhibition comprises 48 of his works and have to be taken seriously as the new pretender on the Canterbury art throne, brings 58 years as a rollercoaster rebel, at times an innovative creator, at times in the past, a fiery event organiser, depending on his mood. "Goat Pass Hut." Another of Juddy's paintings. For climbers, trampers and Coast to Coasters, this is a refuge we have all appreciated. Old Juddy and I go back a long way. I met him first when I did my first Coast to Coast in 1985 and after that we became firm mates.I did the COast to Coast three times before moving overseas again. Three years ago Juddy came to visit me in India and we travelled to Nepal together and had a great time in that fabled city, Kathmandu. We're good mates and exchange emails every so often. Usually I start off with the phrase, "where are you?" and, are you still alive?" Just over a year ago his reply was, "yes, but just. I've had a heart quintuple bypass." Juddy's determination to drink life to the lees, saw him slowly but surely recover. Some years back we talked for more than an hour about disabilities and how you need to turn them into opportunities. 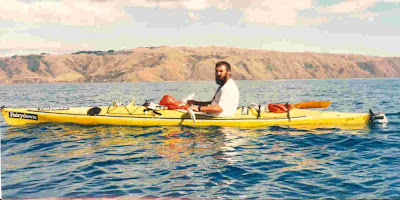 We marvelled at our friend Steve Maitland, who lost a leg in a motor cycle accident, and was regularly able to beat most people with normal legs on the Coast to Coast, a gruelling endurance event over the Southern Alps of New Zealand then kayaking for four to five hours down a major river. Steve Naitland did this event countless times and never saw himself as handicapped in any way. He had the guts and belief he could do anything and he did. Similarly Juddy has made a marvellous recovery after his quadruple heart bypass. Juddy, or Robin Judkins is the organiser, inventor of the Coast to Coast. "Lifeguard Morning Whitewash Head" by Robin Judkins. A painting of the pre-dawn from his home in Sumner. Robin Judkins is a man in the happy position of having seen his moment of insanity become a cash cow. A quarter century after he dreamed it up, Judkins' Coast to Coast is no longer seen as a race for mad bastards – the uninsurable in pursuit of the unendurable. In certain circles it's now almost a CV requirement. It used to be asked "why would you ever want to do that to yourself?" Says Judkins: "The question now is `why haven't you done it?'" The extreme has gone mainstream, become an industry. Triathlon New Zealand estimates that 60,000 people are doing triathlons and duathlons alone. All sorts of people, many with only limited athletic background, are carb-loading and running up creek beds, and Judkins' iconic gutbuster is now just another date on an event calendar crammed with mountaintop scrambles and epic bike rides. Those making gain from the pain range from the bike shops flogging $5000 super-suspensioned rides, to kayak courses, to the physios healing the battered bodies. And Judkins is up against a new generation of event organisers who'd like nothing better than to see their brainchild become the new Coast to Coast. "They're trying to knock me off my perch, to be bigger, to offer more. But that's great. It forces me to lift my game." What's behind all the expensively accessorised masochism? When government sports agency Sparc reviewed the multisport scene last year it found participation rates increasing across a range of what would once have been regarded as extreme-sports events. Most competitors were in their 30s or older and growth was particularly strong among women. The report highlights a general sharpening of awareness of the importance of health and fitness, particularly among women and baby-boomers, and suggests multisport appeals strongly to New Zealanders' supposed individualism and love of the outdoors. It also appeals to the modern consumer mindset. Says Judkins: "People don't want to join sports clubs, to attend AGMs and sit on committees. They want it clean and simple, to pay their money and go. And we wind it out for them like that." Changing attitudes to ageing are probably also part of it, as is the ongoing boom in recreational cycling, with mountainbiking acting as a gateway into multisport. "Recreation and the way we do it has changed," says Judkins. "We used to go off into the mountains in twos and threes on tramping trips. Now we go in our hundreds but we call it mountain running. And as part of that, the clothing, the footwear, the packs and the food and everything else we use has changed." Christchurch-based Jan Kees Kirpensteijn, a former sports masseuse, has built a small business out of the multisports boom designing racing kayaks. He estimates a third of this year's Coast to Coasters were paddling one of his. "It used to be just the bushmen doing this, now it's office people, twice as heavy as they should be, who are waking up and thinking `there must be more to life'. So they come in all shapes and sizes, and as a result we've had to start designing bigger boats." In some respects, Robin Judkins was the catalyst, and notwithstanding some sticky moments – he cites 2002 when he was on the brink of putting his company into voluntary receivership – he's done well from it. "I'm comfortable," Judkins says. "After 25 years doing this, I'd hope I was comfortable. Caption: Ed Hillary (left) and Murray Ellis (r) at the South Pole in 1957. Murray and his son David ran Arthur Ellis and Co with the Fairydown label for many decades. I am slowly catching up on the time difference and jet lag. I have just hung the washing out on the clothesline and noticed more daffodils flowering, despite the snow sitting low on the nearby Southern Alps. Yesterday I started to explore Christchurch and reunite with my 3 daughters who are currently in Christchurch. Spent half a day yesterday walking round central Christchurch and doing a little shopping with my daughter Tania, and her husband Al. 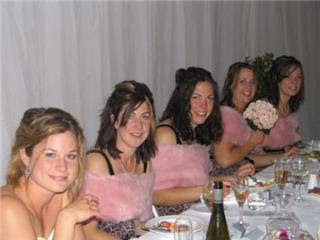 My five daughters from L to R: Kira, Anita, Tania, Ruia and Aroha. The great thing in New Zealand I can buy clothes off the hook which fit me, unlike Asia where I can never get shoes or clothes to fit. Bought some good Fairydown clothing yesterday; warm tops and trousers. While trying on the Fairydown clothes my mind flashed back to 1877 when this company had its humble beginnings in Dunedin. This company kept food on my Mother's table during the depression of the early 1930s when she worked for them for eight years just prior to World War II. So I have always had a soft spot for Fairydown the brand which came from the old established Dunedin company. I wore their Down Jackets in Peru in 1968, Antarctica 69-70 and they sponsored me in 1985 and 1986 on two North Pole expeditions. The company made its name making high quality Eiderdowns from the Eider duck feathers. An old mentor of mine was Murray Ellis who went with Ed Hillary to the South Pole on tractors in 1957. His son David who carried on Fairydown for some years before starting up his own company Earth Sea Sky. 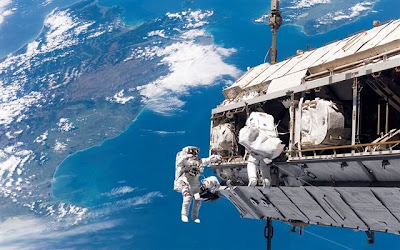 Murray is best known for his role in keeping the modified Ferguson farm tractors going when, in the summer of 1957-58, the New Zealand expedition beat their British counterparts to the South Pole. It was his Dunedin company, Arthur Ellis and Co, which kept the men warm in purpose designed polar clothing and sleeping bags. Murray was part of an inner circle of five New Zealanders known as The Old Firm, led by Sir Edmund Hillary, who achieved this ground breaking feat. Following the Trans Antarctic expedition Murray joined Sir Edmund Hillary in the Himalayas on several climbing trips and to help with aid projects in Nepal. It is amazing how a trip to a shop and seeing a label can trigger such memories. Last night I took the girls and their partners out for dinner at a restaurant called the Lone Star. It is a mixture of Kiwiana and a cowboy theme, rich in history of frontiersman and risk-takers. The walls drip with a rich collection of art and memorabilia enhanced by the addition of some local art and a fair swag of Kiwi tunes in combination with our famous country music. The music of Johnny Cash, Elvis Presley, Crowded House, Johnny Horton, Dwight Yoakam, and Dolly Parton music rings out and they have all become part of the culture here. The food was superb serving the best and freshest local produce served up with a genuine smile in generous portions for a totally fun, unpretentious night out. Its 9.15 am and the sun has just come out. I think I will take Diva for a walk and get some sun and exercise. The Fairydown clothing will keep me warm as I walk with history on my back. Labels: Arthur Ellis and Company. I arrived in Christchurch about 24 hours ago. After a long flight from Jakarta to Singapore, another flight from Singapore to New Zealand, I was so excited to see the coastline of the South Island just south of Hokitika as we reached New Zealand about 8.45 am yesterday morning. Then a few minutes later I was greeted by a view from 7000 metres of the white, spiny mountainous backbone of New Zealand, the unsurpassable Southern Alps. Misty on its verdant western slopes, then rearing out of the cloud, were Aoraki Mt. Cook, Tasman, Sefton, La Perouse, Torres, Douglas and Eli de Beaumont, and closer still. I could pick out a cluster of peaks that looked like Mt. Evans and Red Lion Peak at the head of the Waitaha valley, all places of my adventurous youth. What a greeting ! Then we soared over the peaks of the Arthurs Pass region and then dropped altitude to the snowy foothills ringing the Canterbury plains. The plane banked and turned over the Pacific Ocean and lined itself up for a safe landing in Christchurch. Christchurch was every bit as beautiful as I remember it when I was lasy here almost 2 years ago. On reaching my home in Bryndwr, Diva, my daughter’s Chocolate Labrador was so excited to meet me. I walked around the house and noticed the Kowhai tree had grown, as had the various tussocks, ferns and scrubs. 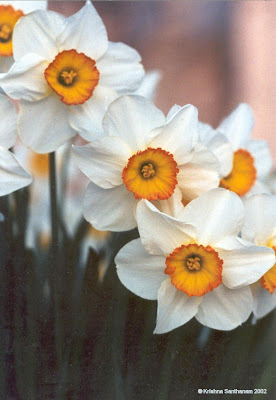 Then, I a saw a host of yellow daffodils in a sunny spot at the rear of my garden, beneath the apple vines. Daffodils in mid July ? I looked up and saw camellias flowering on the tree. Following the cold spell there have been a few hot days and these hardy daffodils have raised their heads for my arrival. Being greeted by a dog, daffodils, camellias and trees was a stirring welcome. I strolled over to the vege garden and only rhubarb and parsley were to be seen. Aroha called a few minutes later. She is a fashion designer here in Christchurch too. “ I finish work at 4.30 p.m so I will jog over to see you round 6 p.m.” dhre said. Jogging is her transportation. She thought nothing of an 8 km run to see her Dad. Tania and Al arrived by bus from Timaru They run an outdoor education centre near Whakatane called Kahunui, designed to give high school students in Auckland, a taste of the great New Zealand outdoors, by running 28 day courses. I later called Anita my eldest who lives in Timaru. She and her partner Jonts have just bought a new house in Timaru where they live with their three boys between four and a half months and five. I am heading down there early next week and am so excited about seeing my grandchildren, the youngest Billy, for the first time. The first to arrive home was Ruia on her bike, then Aroha jogged in and later Al and Tania by bus. I hugged each one by one as they arrived and thought how lucky I am to have five daughters in New Zealand. God has blessed me richly. The corned beef, potatoes and huge pot of veges tasted superb, accompanied by a tasty Cabernet Sauvignon. The only one I couldn’t contact, was Kira who works as a jeweller in Wellington. I spoke to her last weekend from Jakarta and will call her today. We talked through the night into the early hours of the morning catching up on all the news. Today it will be visits to bookshops, outdoor clothing shops for warm clothes, a mountain bike trip and a family dinner in the evening. I would like to share a note I got from Simon Nathan about "the Bush" some months back. 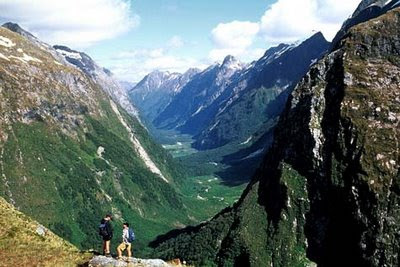 The bush is in the heart of every New Zealander. Our souls and wairua are firmly planted in the bush whether you are Maori, Pakeha or Asian. 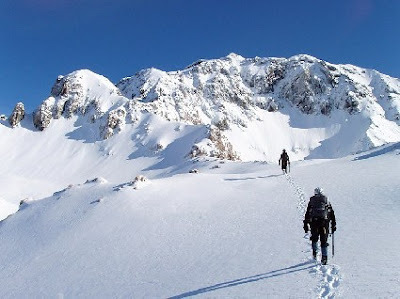 In particular I thought that you might be interested in the section called "Bush and Mountain Recreation", with articles on Mountaineering, Tramping,Walking Tracks etc. 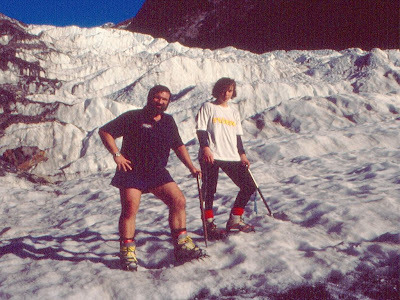 If you poke round, you will see that I managed to get one of the classic photos of Teichelmann, Newton and Graham in the mountaineering article. The Southern Alps from Christchurch, my home town. "This is my land and I am firmly rooted in it, " wrote Albert Wendt, the great New Zealand writer. On Monday I am returning for a three week holiday. My God, I need a break ! It is almost two years since I was last in New Zealand. After working with the Tsunami and Yogyakarta earthquake recovery operations as well as long term development programmes in Indonesia, I can almost smell "the green, green grass of home." 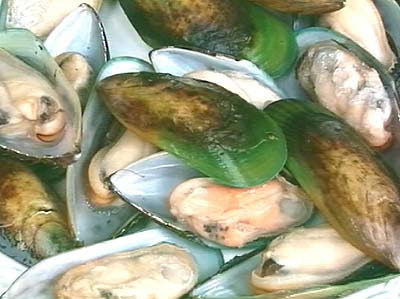 Oysters, green-lipped mussels (pictured above), blue cod, juicy tomatoes and sausages spring to mind when I think of home. I am drooling about my trip on Tuesday into a Christchurch supermarket. And then there are the bookshops to explore before the mountain trips. 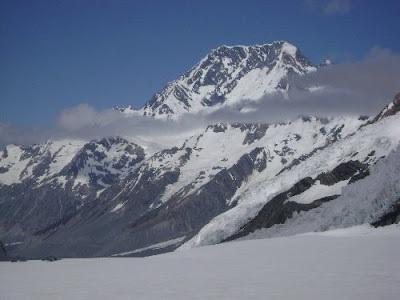 In Jakarta I dream of visiting my old haunts such as Pioneer Pass at the head of the Fox Glacier. 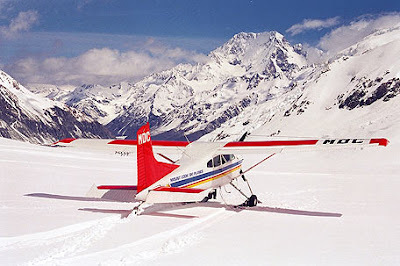 I hope I can get my old friend Alex Miller to fly me in, in one of his Mount Cook ski planes. At 68, he must bs the oldest ski plane pilot in the World. 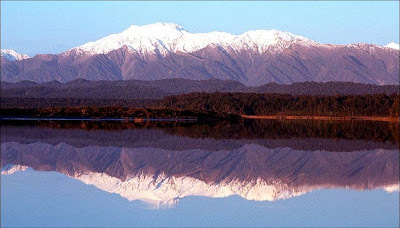 I hope I can join up with Bruce Watson and travel from Hokitika down the west coast of the South Island to Okarito, and look across the lagoon to the Southern Alps. Old friends Alex Miller (l) and Bruce Watson (r). 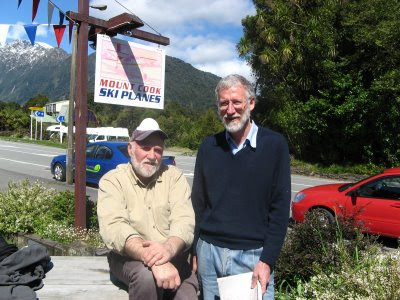 Alex the ski plane owner and piolt and Bruce the conservationist and bookseller. I want Alex to fly me into the head of the Tasman Glacier and view Aoraki Mount Cook again, a peak I climbed 3 times when I was younger. 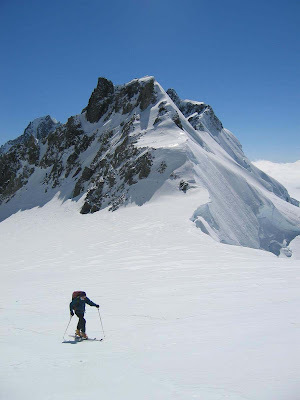 A Grand traverse, an ascent by the east ridge and another by the Linda Glacier. The ski plane has been around for 60 years in the Mount Cook region and is still a great way to travel to the feet of the mountains. Alex Miller first flew me in 1971 to the Malte Brun strip. So what does my land look from space ? The central and northern South Island from somewhere up there..
Today, Friday night, I just returned from Banda Aceh where the Red Cross has been working for well over three and a half years. The progres on reconstruction/rehabilitation is outstanding and I feel OK about leaving Amara, my deputy, in charge for three weeks. To see my five daughters and my three grand children will be the greatest joy. Young Billy, who was born six months ago, I have yet to see. Roll on Tuesday morning and that flight over the Southern Alps and the landing on the green, green grass of home.